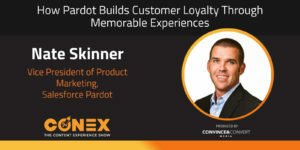 Nate Skinner, Vice President of Product Marketing at Pardot, joins the Content Experience Show to discuss memories as the foundation for customer loyalty. Gaining a first-time customer is always a success, but it is really only half the battle. Turning that first-timer into a repeat customer is the true win. Customer loyalty is the lifeblood of a thriving business, and simply having a good product isn’t enough to build on in today’s economy. People care about experiences. When someone walks away with a memory of their amazing experience, they are far more likely to come back for more. This means that your business should be using every tool available to know and understand your customers so that you can serve them the best possible version of the experience they seek. Your product is your vehicle for delivering memories that foster true customer loyalty. How to keep many teams with individual goals aligned within a large company. How to turn current trends and data into experiences for your customers. Why artificial intelligence has become crucial for analytics. Why customer loyalty is built on memories. If you had a new pet, what would you name it? Nate would name his pet Hamilton after his daughter’s (and subsequently his own) obsession with the Broadway show! Randy has been talking with his wife about the possibility of getting a bulldog and naming it Dwayne Johnson! 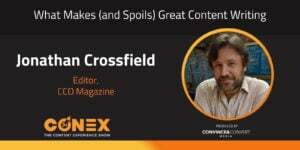 Randy: Hey, Anna, we had an awesome guest on The Conex Show this past week, and it's kind of coming right off of Conex, the in-person event that happened in Toronto, where we saw Nate Skinner talk about the need to keep the attention of our audiences. It's so hard today with all the distractions we have, but he really zeroes in on this. What I found cool about this one is not just his stance on how to keep people's attention, but also the challenges he has at a company the size of Salesforce.com. I mean, that's pressure, right? Anna: Yeah, totally, especially they are sort of one product within all of Salesforce, so you have that added structure complexity, and reaching new emerging marketers, and keeping their customers. Nate goes into some just really great tips and tricks, especially if you work in an organization that has a really complex structure, or you have multiple different goals that you're working towards, or you're even kind of ... I don't want to say duking it out for resources, but if you're kind of one in a set of many, he has just a lot of great tips and tricks and framework sort of advice. Anna: Yeah, and we learned how to say Pardot. Randy: Yeah, we did. We did. We learned a lot about him. We got into some of the cool campaigns they're going to do at Dreamforce. One of the things that we didn't hit on, and I don't know how this didn't come up, because you are from Phoenix, and tell me if I'm generalizing, is that he went to Arizona State University. Is that a good or bad thing? Randy: Okay. I don't know. I figured Phoenix, Arizona. Anna: ... can't speak to it personally. Anna: It is. Of course, I'm going to defend it. Anna: Yeah, it's ASU versus U of A, but I went to NAU, so I stay out of it. Randy: Okay. That's fair. That's fair. We're also confusing the other podcast we recently did on education and school and alumni, but you can go and listen to that podcast, too. For now, you're tuning in to hear about how a marketer at a company that's worth over $112 billion executes at scale. Enjoy this podcast. Let's roll with it. Anna: Hey, Nate. Thank you so much for joining us today. It's really great to have you here. Nate Skinner: Hey, Anna, thanks for having us. Glad to be here. Anna: Yeah. I know. It's so great, especially I just saw you at Conex, so now we get to talk to you again. I got to know you a little bit at Conex. Anybody who went to Conex got to know you a little bit more because you actually gave a great talk there. But for those who couldn't join, would you mind just telling everybody a little bit about yourself? Nate Skinner: Sure, yeah. It was great to meet you, Anna, at Conex, an awesome conference. Anyone that didn't get a chance to go, I highly recommend it from the team there. Yeah, Nate Skinner. I run marketing for Salesforce Pardot, been doing marketing for 10 years now. The first 10 years of my career was all field, so I was in the field as an SE and a sales rep and an inside sales rep back in the early days. I don't want to date myself too much. But the second chapter of my career started 10 years ago, and has been 10 years this next year, actually, explicitly focused on B to B marketing. Anna: Nice. Congrats on the 10-year anniversary. That's awesome. It's always fun when you hit those milestones. Randy: I'm also really relieved, Nate, because so many people look at the word Pardot, and I've had them do like the "Tarszay," if you will, right, like the Target, "Tarszay." Yeah. But we've now got you on audio, so I'm just going to say the person who runs marketing there says it's pronounced in this fashion, so thank you for clearing things up out of the gate. People are already way ahead of where we were. Nate Skinner: It is Pardot, not Pardo, and some day when you guys ... Adam Blitzer on the podcast, you may want to ask him about the backstory. It's a pretty fascinating story in how we found our name. But it is, indeed, Pardot. Anna: I love it. We'll leave people with a cliffhanger, so we'll tease everybody out with that. Nate, you have a really interesting structure there, though. You and I have had some chats, and we've been chatting with Randy. You actually are a company within a company, correct? Nate Skinner: Yeah. I mean, it's probably more accurate to say a product within a company full of products, but that is true. We have a very large organization. Salesforce has over 30,000 employees worldwide, operating in a lot of geographies around the globe, and marketing is not unique in that capacity. We have teams all over the world. Anna: All right. You have a couple of different things going on here, which I'm really interested to pick your brain about. One of them is being a product within a company, and sort of having obviously ... I'm sure you align to the same sort of ultimate vision and goals, but you obviously have your own internal set of goals for Pardot. Then, of course, you have your own dedicated teams and things like that, so that creates ... And then, of course, coupled with globalization and different geographies. You have a lot going on there. How do you kind of unpack that structure and what does that structure look like internally? How do you guys operate and create all of this great content? Nate Skinner: Yeah. That's a really great question, Anna. I'm sure that a lot of listeners face this, too, depending on the size of organization and mission. The Salesforce corporate model for alignment is what Marc has always called the V2MOM, Marc Benioff, our CEO. From the beginning of the company, this V2MOM framework is an alignment structure. It stands for vision, values, methods, obstacles, and measures. The idea there is that you start with the company vision. You describe your company's values. You describe methods. Methods are like our top priorities as a company, literally from one to 10, what are the most important objectives of the company. And then you describe for each method a number of obstacles and a number of metrics. Because of that being core to the Salesforce way, it ladders down. Teams like mine inherit from those teams above and to my left and to my right mechanisms from their V2MOMs, and that actually lends itself to a very well aligned global company. It's surprisingly aligned for the size. In my experience, rarely do you see this, especially as I talk to customers who struggle with this challenge. If I gave someone a tip, I'd say come up with a framework similar to that one, because it really does help our team feel connected to the global Salesforce mission while, at the same time, maintaining our own objective and our own identity within the larger Salesforce team. Randy: You guys do it so well. I mean, as you hit on, Nate, you have so many different products at Salesforce, and here at Uberflip we use a number of them, but we don't use all of them. I don't necessarily always see all those marketing assets and see how they're all aligned, but there is one time of the year which I think we're all pretty much in prep mode if we know Salesforce and we're a customer for, which is Dreamforce, right? That's the event I go to, and I am amazed not just at how big the event is, but how wherever you are, there is this consistent brand. There's this consistent messaging, this consistent theme that comes across. Maybe since you're probably in Dreamforce mode right now, maybe let's use that as an example. How does that work? Nate Skinner: Yeah, that's a great one, and I was thinking about this Dreamforce this morning. This is my 10th year. My very first Dreamforce was 2009, and so when you add them together, including '09, to 2018, this will be my 10th one, not all that time as an employee, but even as a partner at another company in between. I was here before, and I left, and I came back. In all those times I've been part of Dreamforce in some capacity for 10 years, which is crazy. Randy: People literally stay on a boat, right? I know that happened the last couple of years, because there's not enough hotel rooms. Nate Skinner: Yeah. Interesting, I don't think we brought back the boat, but yes, housing and hotels run out of room. It's fascinating. Some people from my team, in fact, come over on BART. They stay in Oakland or down by the airport and they take the BART, because if there are rooms left, they're very expensive. But it's kind of testament to the reach and the message that Salesforce has for our customers and our partners that everyone wants to be there. Most people, when you ask them why, it's because they want to learn what's happening, what's new, what's available to them that will help them transform their company. At Salesforce, we call those people trailblazers, right? The trailblazers at companies like Stanley Black & Decker, her name is Lily, who come to Dreamforce to both learn how others are doing what she's doing, but also to impart their knowledge on others and share their insights. That's really what it's all about. Kind of back to your question, in similar alignment, we have a Dreamforce steering committee, and it's led by a lady named Brigitte Donner, who I've known for quite a long time. She's been around Salesforce almost as long as I have, if not as long. Starting at kind of her purview of all of the things, right, the landscape of the conference itself, starting in Moscone and branching out to hotels like the Marriott, where we have our keynote, to The Palace Hotel, where we have the Pardot home base in The Pied Piper Restaurant, they're looking at all of that and saying, "How do we connect people to the experiences that matter to them?" That really is the guiding kind of North Star, is if you come to Dreamforce and you're a marketer, or you come to Dreamforce and you're a sales rep, or you come to Dreamforce and you're a marketing operations person, or a sales ops, or a revenue ops person, where do you go to make sure you get the most out of your time? The Dreamforce campus is laid out in such a way to allow you to find your way to the place that makes the most sense for you based on what you do and who you are. I think that speaks to content, right? 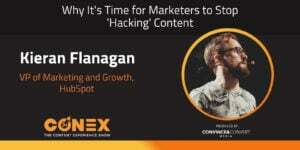 I mean, as I come out of Conex, to Anna's point early on, I talked about the Conex conference. Our talk was about elevating content to the experience level. 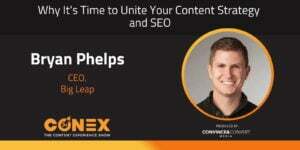 The whole Conex conference was about content experiences. We think about taking content as part of an even larger experience. How does that translate physically in the space at Dreamforce for each human being? It's very different depending on who you are. Randy: Yeah, it's so true. It's funny. As you were describing that experience of navigating Dreamforce, and I don't have 10 under my belt, but I've got a few, I would almost compare it to going to Disney World, right, where you can go into Disney World as a five-year-old, 15-year-old, and sometimes you see those scary 45-year-olds who are there themselves, but they all have this experience tailored to them that they can navigate and find. You're right, it's very much that same type of experience when you go to that event. I'd love to dig deeper into how you're all uniting around creating this content, but before we do that, we're going to take a short break here. As we go into it, I want to reinforce that marketers should go to The Palace Hotel, because that's where I've gone to kind of find my home base when I'm at Dreamforce. On the second floor, there's lots of great breakouts, and as you said, there's that Pied Piper space on the first floor of the hotel that is kind of the Pardot HQ, if you will. Am I describing it right? Nate Skinner: Yeah. I mean, it's B to B marketing home, right? If you're especially a B to B marketer, The Pied Piper is kind of home base. And then if you're a marketer more generally, or a B to C marketer, The Palace is the rest of our programming. Everything, Randy, to your point, if you're a marketer, self-identified as a marketer, B to C or otherwise, B to B or otherwise, start at The Palace and work your way out. Randy: Gotcha. All right. Let's do a quick break, and we're going to keep digging into the content you're creating around this event and other executions for Pardot. Anna: Hey, Randy, on behalf of Convince & Convert, I just want to say how great it is that we get to partner on this podcast together. Randy: Yeah, this is so much fun for me, Anna, and for Uberflip to be pat of this. We learn so much. But every once in a while we get to do one of these sponsor reads, and we naturally couldn't send you to our website. That would just be shameless. What we like to do is give you contact, and we've got a really great asset to drive you all to today, because it ties all around content experience and whether it's working. What we did was instead of doing a survey, we actually looked at data. In that data, we found eight data science insights that help boost content engagement and conversions, and that's what we all care about, is growth and making sure that our content is working for us. You can get that killer report. You don't want to miss it. Go to uberflip.com/conexshowreport, so that's Conex show report, with no spaces, and have a look. Let us know what you think. And please enjoy on behalf of now, Anna, you and me. I'm going to tell you about a book that is partly all Jay Baer but partly selfishly for me, Randy, I'm really excited about. This is Jay's new book, Talk Triggers. If you've read Youtility before, Hug Your Haters, this is going to be right up your alley. I mean, it's focused 100% on how to grow your business, but in the ways that we don't expect, in the ways that we get our audience to start talking about us, and the way we do that is word of mouth. To get that, we need to create these memorable stories, and that's where I was really excited and honored that Jay included myself and Uberflip as one of the stories in Talk Triggers. It's the story of our headbands and how they kind of captured our audiences and created this following where people would talk about them when I'd run into them at events. There's a whole part of a chapter on it. I think the cover of the book is this beautiful pink which Jay tells me I get a little bit of credit for, too, because of the pink headbands. So when you see that book with its beautiful pink cover, and the alpacas on the cover, which I have no idea where those come from, pick it up. Go to talktriggers.com. I guarantee you'll enjoy. Anna: All right. Right before the break, Nate, we were talking about Dreamforce and how there is going to be just a lot of fun things happening, but also, most importantly, people are going to go to this event and they are going to learn a ton, and they are going to get a ton of information. They're going to learn about a lot of new trends. They are going to want to go back and implement all of these things. But maybe kind of when they get back, there are some organizational issues and things like that. In your perspective, how do you recommend people kind of take all of these trends that they're reading about, that they're seeing, that they're hearing about, and bring it back and actually create these experiences for their customers? Anna: In a great way. Nate Skinner: Yeah. I mean, there's more to learn and consume than you could possibly kind of keep in your head in one sitting, and that's a good thing, but at the end of the day, I think what I find people ask me all the time and want to understand is how do we go actually practice what we've learned. How do we put some of these concepts into play at our company? And those concepts vary, right? There are some very abstract and some very meaningful or impactful technologies at play here today. But most folks that I work with, when they come to us and say, "Hey, artificial intelligence, everybody's talking about it. How do I take advantage of it? What does it mean to leverage AI in my business as a marketer?" People talk about the breadth and depth of data. Data is everywhere. It's constantly coming out of everything and every place, now with connected devices, connected homes. All of the data that's resulting from this modern kind of industry, the modern world we live in, is driving a need to understand what to do with all that data, to synthesize it, and learn a new level of analytics and understanding. The answer to your question is, "Hey, Nate, how do we take advantage of it? How do we actually implement some of this amazing technology at our firm?" And we start the answer to that with, "What are you trying to achieve as a company? How do you define success?" And then back into the solutions that make the most sense for you. Oftentimes, they happen to be if you're not taking advantage of artificial intelligence ... and for Salesforce, that means Einstein. That's our embedded technology in the platform for AI. If you don't have that turned on in your organization, then the machine is not doing its learning on your behalf, right? Everything you're doing manually means that, by definition, you're behind. Then on the analytics side, if you're getting all this data and you don't have a platform on which to analyze and to understand what it means, the analysis part of data analysis, then you're missing an opportunity there as well, and that's technology like B to B marketing analytics from Pardot or the Einstein Analytics platform at Salesforce. But ultimately, use something to leverage artificial intelligence and apply an analytical capability to your business. Otherwise, you're kind of shooting in the dark. Randy: Yeah, and that was a big trend that we had last week when we were together in Toronto from a lot of the talks. It's the importance of not necessarily AI. I don't know if that was in everyone's talk, but it was about personalization. How do we start to create content that's going to better connect with people because, as you talked about in your address to the crowd, we're all distracted, right? I loved the way you portrayed this. You even brought in same ingredient I use in all my talks, which is kids. You had a great kids video. But maybe tell us about how you are overcoming that distraction factor that people have. Randy: We do so much for our kids. We have to use their footage. It's their only way of paying us back as marketers. Nate Skinner: That's right. Putting him into the talk at Conex as my protagonist was fun because he actually is a representative example of exactly the problem you just described. He's three, and three-year-olds, if you know any, they're easily distracted. In fact, keeping their attention for long periods of time is almost impossible. What's happened in his lifetime, three years, he grew up in an environment where everything is instantly on, right? There's the iPad. There's the Google Voice. There's the Amazon Echo. There's an iPhone. My car has a computer screen and a monitor in it. He's not used to not having it all on all the time. That is going to be ... That's our future, right? That's the next generation. If we think that kids and the millennials of the world are distracted now, just wait until my son is 24 years old and in his first professional job. 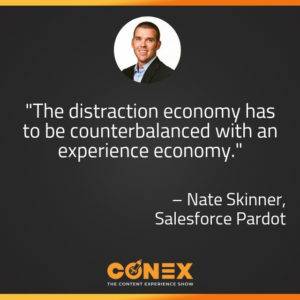 That kind of distraction environment or distraction economy, if you will, has to be counterbalanced with what we talked about at Conex, which is an experience economy. We looked through a lot of research and found this amazing Harvard Business Review that talked about the coming experience economy and the need to take things like content and connect them to everything that a customer or a prospect will engage with from the moment they hit your website to the minute they buy whatever it is you're selling them, that all of those things should be connected, that ultimately creates an experience which is more memorable, and memories are what create loyalty now. Gone are the days of, "Oh, they'll give me some points for me rebooking at that particular place, or buying a ticket from that particular spot." More likely, what I will return my business to you because of is that you've left a memory for me, and a memory you can't take over. It can't be bought. It can't be replaced easily. That's what we talk about when we help our customers understand how do you create connected experiences, especially as marketers, who arguably in a company are the ones who care about that the most, right? They're the ones who have kind of end-to-end responsibility for what that experience is like for customers. Anna: I love that. Also, one comment here before I have a follow-up as well, is that by far and away, the chatter that I heard around your talk was that they loved that you incorporated your kids into it, just how everybody was like, "Oh, he's so adorable," so just so you know, everybody loved the anecdote and hearing all about it. Then also, too, it also reminds me of Andrew Davis's talk, where he was talking about the curiosity gap and how it's really not just getting that attention. It's easy to get someone's attention, but then to keep it is really where we have to create that curiosity gap. I feel like you follow up perfectly with that, with not just keeping their attention but also retaining them and keeping them going with us, with the distraction economy, and just keeping them on board, basically. Not just engaging them, but creating experiences that keep them around, too, which is something that we don't talk enough about in general in marketing. Nate Skinner: Yeah. I mean, that's absolutely right. Extraordinary content, as a great example, it can change someone's mind, or engage them in a way they've not been engaged before, or it can cause them to take a particular action. The question is is it memorable so that they come back to it without remembering or having you call. Is the content connected to an experience that leaves a memory? That's actually the opportunity. That's what I loved about Conex, actually, and I talked to this in my talk, was it's easy to have a conference. Lots of people do. Conex's conference was an experience, just like Dreamforce is an experience. I think Randy kind of likened it to going to Disney. It's the same thing at Conex. For those that weren't there, it was at the Royal Music Conservatory. Did I say that right, or is the Royal Conservatory? Randy: You nailed it. It's a mouthful. There's more to that title, but that's more than enough credit that you're giving them. Yeah. Nate Skinner: So it was at this Royal Conservatory of Music. The theme was music. The T-shirts had vinyl records on them. The tracks were all named after songs. That is an experience. That's taking a regular technology conference and taking it up a couple levels, right? Dreamforce, we do the same thing. We have a trail head theme throughout, where the idea is that national parks allow you to explore and become part of what you're involved in, what's the best part of our country and our nation's legacy. And those that set off to create those environments we call trailblazers, and that's the theme throughout, and so everything you see and everything you feel is that experience. That goes to content and it goes to marketing, too. As opposed to getting someone's attention for just a second and then it's gone, how do you get their attention, keep their attention, leave a memory, and never have to worry about whether they know who you are or not? That's a different level of operation that marketers today, we find, are struggling with understanding how to do it. Those that figure it out are winning. And those that haven't yet figured it out need to figure out how to catch up, because the world is now in a place where it is extraordinarily difficult to kind of filter through the noise. Anna: Couldn't agree more, and I know Randy agrees with that sentiment as well. Honestly, I feel like you just kind of dropped the mic right there and delivered sort of just this amazing piece of wisdom. I love it. I agree with it. We know that you are going to be at Dreamforce. You just got off Conex. You're going to be at Dreamforce and delivering even more insights and amazingness. Where can people find you at Dreamforce? Or where can they connect with you and sort of see you and talk more with you about all this? Nate Skinner: Yeah, thanks, Anna, appreciate the opportunity to have this discussion today. Dreamforce is September 26th to 29th. Thursday, September 27th, at 10:30 a.m. we will be delivering our Salesforce for B to B Marketers keynote at The Marriott Marquis. That's for those that are attending Dreamforce, September 27th, 10:30 a.m. The other place is The Pied Piper. Randy and I talked earlier in the podcast. At The Palace Hotel, right on Market and New Montgomery, in the lobby kind of to the right is a restaurant called The Pied Piper. For Dreamforce, our team at Pardot takes over that space, so that will be kind of B to B marketing home. In fact, I think, Randy, your team's joining us in this space as well, I think. Randy: Absolutely. I can't wait. I mean, as I will tell people who have not been to Dreamforce, it's nice to know you have a home, and we are very excited to be sharing some space with you this year. Nate Skinner: Yeah. The last thing I'll mention, because if I don't, our customer will have missed an opportunity, we partner with the SPCAI. Their mission is to save animals worldwide. It's a nonprofit organization. Last year at Dreamforce, the Pardot team partnered up with them and we had a puppy kennel on the third floor of The Palace Hotel, and literally you could come in there and pet these puppies, and it was kind of amazing, and you'd walk into this room, and it smelled very much like a puppy. It was awesome. We had three puppies adopted last year, if you can believe that. I was shocked. It was awesome. This year we're taking that to the next level, and we're going to have the Pawdot Puppies, is what we call them, out on the side of the street, on Jessie Street, next to The Palace Hotel. We're building out the space there so the puppies can be outdoors without being at risk of getting hit by cars or anything. But it'll allow everyone in the City of San Francisco to come and engage with the SPCAI and pet the Pawdot Puppies, and ideally adopt some of them or make donations to that organization for saving more animals. That's the last. Randy: That's awesome. I'll tell you, I was there last year. I took a pic, and my wife was like, "Bring one home," which I did not do to Toronto, but it is extremely heartwarming and a great thing that you guys do to give back. Anna: I'm just sitting here with the biggest case of FOMO, already missing out because it's Dreamforce, and then, Randy, you described it as like Walt Disney World, and puppies. I'm dead. That's it. I'm done. Randy: Well, everyone's hooked now. Nate, what we're going to do, we're going to get you to stick around. We always like to get to know our guests a little bit after we talk business. We'll do that right back here on The Conex Show. All right, Nate, so I had this whole set of questions that I was going to ask you coming back on the personal side, but you kind of warmed all of our hearts with the dog thing. Now I'm curious if you're a pet guy. Did you ever have a pet as a kid? Have you brought one into the home with the family? Are you going to be one of the guys adopting? Nate Skinner: That's a great question, Randy. I love puppies. I had a dog when I was a kid named Cracker, a golden retriever, and then I had another dog back in '97 that was a chocolate lab. I loved both of those dogs. But for me now, with my lifestyle and as much as I travel, I'd feel like a dog was not served well at my home. They'd be at a boarding house more than they'd be at my house, and so for now, no, but knock on wood, someday, maybe. I love dogs. Randy: Okay. So we're going to play a quick little game here. Anna, you're going to be on the hot seat, too. If you had a new pet, like a dog or something, what would you name it? What would be your new pet's name? Because you just threw some good ones out there, Nate. What would be your pet's name? Nate Skinner: I'd have to go with Hamilton. Nate Skinner: Yeah. My daughter is totally infatuated with all things Hamilton, and it's forced me to then become infatuated with all things Hamilton. I just finished the book by Ron Chernow that's very long called Hamilton, which is what the play is based on. But now I'm a huge Hamilton fan, and so I would probably name my pet Hamilton. Randy: All right. All right, Anna, you're up. What would you name your dog? Anna: Oh, man. You know what? I genuinely am terrible about naming animals. For example, my cat's name is Kitty because we don't know what to call him. But I know people who ... I would want to name it something really obscure and random, like Cheese or Toast, or I knew someone once who had a cat named Kurt Russell, and that's at the top of my list. Randy: Amazing. Okay. I have a dog. I have a dog who's almost 14. But my wife already talks about the next dog, which I will probably veto, but we still play the name game because we're not having more kids, so you've got to do something on those long car drives. I think she's got the best name. She wants to get a little bulldog and name it Dwayne Johnson, which I think would be awesome. If you're a Rock fan or Jumanji or whatnot, you know who I'm talking about. All right, guys. This has been so much fun, Nate. Thanks so much for helping marketers tune in and understand what it's like to have such an exciting role in a company that is at the scale and size and impact of Salesforce, and within your world of Pardot. We thank you so much. For those who have been tuning in, if you've enjoyed this podcast, check out some of our other episodes. Anna mentioned one of them with Drew Davis that was a couple weeks ago, where he talks about curiosity gap. All those episodes exist at thecontentexperienceshow.com. Download us on anywhere you get your podcasts. Let us know what you're enjoying. Until next time, thanks so much for tuning in.